After being passed over for government funding in NASA's commercial crew development awards, rocket contractors United Launch Alliance and ATK are keeping their human-rated launch programs alive for now in anticipation of another NASA competition starting late this year. NASA awarded nearly $270 million to spacecraft builders in April, arguing rockets were more mature and posed less development risk than the capsules and space planes being designed by other companies. ATK's proposed Liberty rocket and a human-rating plan for ULA's Atlas and Delta rockets received no government funding in the second round of NASA's Commercial Crew Development, or CCDev 2. "We submitted, I think, a very good proposal," said Mark DeYoung, ATK's president and CEO. "In fact, our proposal rating when we received our debrief from NASA was very strong." The Liberty rocket resembles the Ares 1 booster cancelled by the U.S. government in 2010. With a five-segment solid rocket motor first stage and a cryogenic upper stage derived from Europe's Ariane 5 launcher, the Liberty could lift 44,500 pounds to the International Space Station's orbit, enough capacity to carry any of the commercial crew spacecraft currently planned. "If you look at what was awarded, they only awarded capsule content," DeYoung told investment analysts in a May 5 conference call. "They did not award any launch vehicle content. We continue to work that in cooperation with our partners." ATK's primary collaborator on the Liberty rocket is EADS Astrium, the lead contractor for the Ariane 5. The Liberty's second stage is essentially an Ariane 5 core stage with a hydrogen-fueled Vulcain 2 engine. Brian Duffy, ATK's vice president for exploration systems, said the company is continuing internal work on the Liberty rocket. The rocket's preliminary design review, a key development milestone, is still scheduled for August, Duffy said. United Launch Alliance, the operator of the Atlas and Delta rocket fleets, requested funding to continue development of an Emergency Detection System, a computer that would recognize a launch vehicle failure and trigger an abort. The company was awarded $6.7 million to start work on the EDS in the CCDev 1 competition last year. "ULA is in the process of meeting with our partners and studying our options to determine a path forward," said Chris Chavez, a company spokesperson. "We have met all of our obligations on CCDev 1." ULA planned to select a vendor to build the emergency computer this year, then put the system through testing to make sure it will survive the noisy, bumpy environment of launch. The company would like to put the EDS on unmanned satellite launches before trying it on a crewed mission. Although ULA hasn't announced its next step in the commercial crew program, the company still expects its Atlas and Delta rockets to be available for human missions. More NASA awards, internal funding and contracts with spacecraft providers could supply the money necessary to continue EDS development. 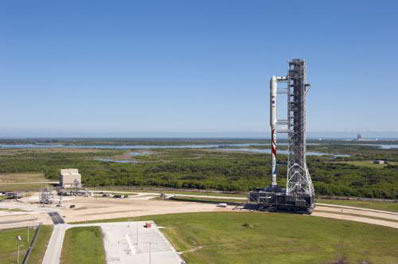 SpaceX's Falcon 9 rocket is also in the mix to launch that company's Dragon spacecraft, but like the Atlas and Delta vehicles, it has already successfully flown. Phil McAlister, NASA's acting chief of commercial human spaceflight development, said spacecraft developers faced a tougher challenge than rocket companies in the effort to make private space travel a reality. NASA is turning over crew transportation to low Earth orbit to private firms after the space shuttle retires, allowing the agency to direct more funding to designing and building a heavy-lift rocket and space capsule designed for exploration into the solar system. But none of the commercial proposals will fly before 2014, and that's just a best case scenario. NASA believes rockets could be ready to launch human crews on shorter notice, ruling that spacecraft from Boeing Co., Sierra Nevada Corp., SpaceX and Blue Origin needed funding more now. ATK does not have an agreement with a spacecraft provider to launch humans on the Liberty rocket, but the company contends the booster could accommodate any vehicle currently on the drawing board. ULA is closely working with Boeing, Sierra Nevada and Blue Origin to deliver their piloted vehicles into orbit on the Atlas 5 rocket. 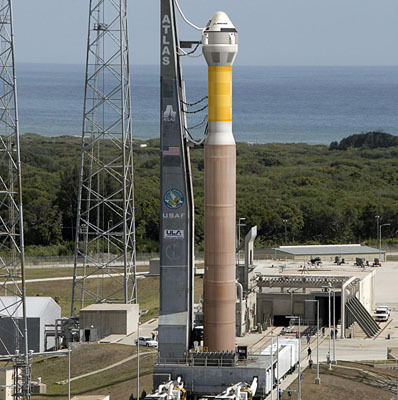 NASA gave the ATK and ULA proposals high marks in business and technical readiness. The space agency expects to solicit more proposals for the third round of the CCDev program before the end of 2011. Awards could be announced in early 2012. Officials hope to issue up to $850 million in the CCDev 3 awards if lawmakers appropriate enough funding for the commercial crew program. "We believe there's yet to be awards on commercial crew in terms of launch vehicles," DeYoung said, noting ATK intends to remain eligible for additional funding.